In a large salad serving bowl, arrange the leaves of the butter lettuce, tearing the larger leaves into bite-size pieces. 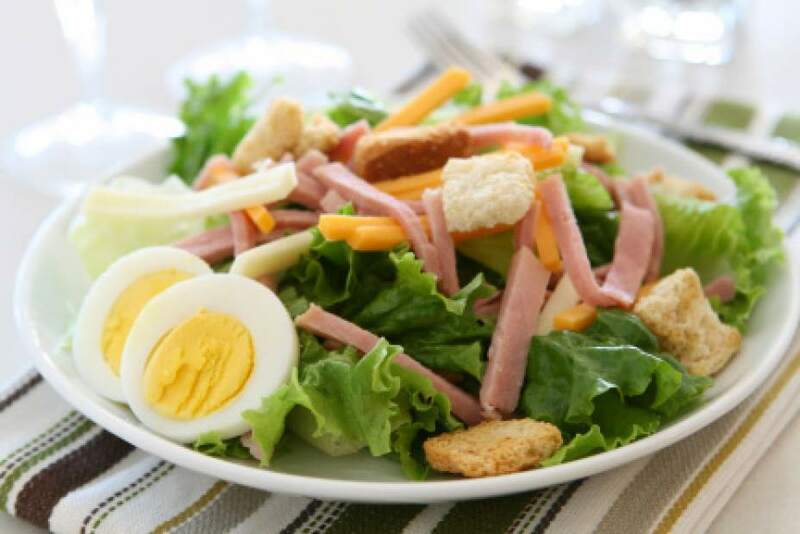 Arrange the ham, smoked chicken and cheese on top of the lettuce. You can keep each ingredient separate from the others or jumble them all together. The julienne strips could radiate outward from the center of the salad like the spokes of a wheel. Place the wedges of cherry tomato and hard-boiled egg among the main ingredients. In a small bowl, whisk together the lemon juice, mustard, shallot, and salt and pepper until well-blended. While continuously whisking the dressing, drizzle in the oil, and continue whisking for another 10 to 20 seconds until emulsified. The salad should be served with the dressing on the side, then dressed and tossed at the table.